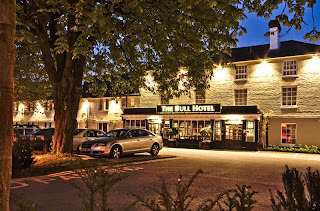 The Bull hotel is situated in Gerrards Cross, close to London and all its attractions. Part of the Sarova hotel group the hotel is renown for being quality and offering a fantastic service. 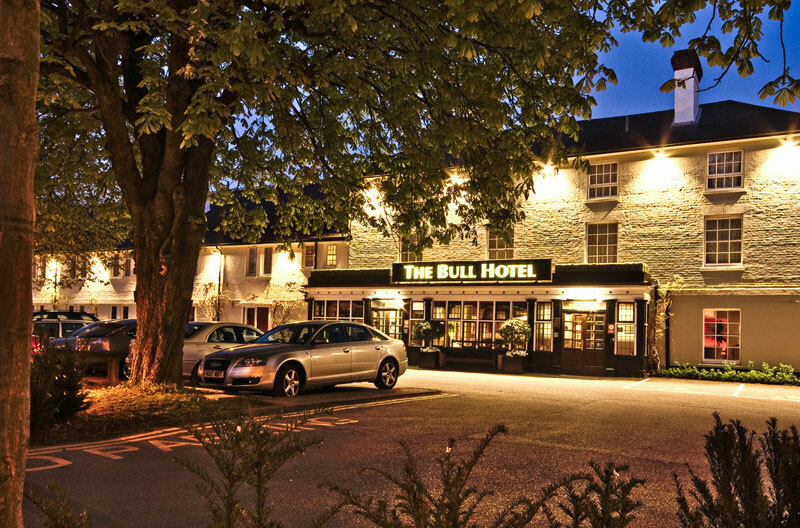 The Bull hotel is also open to host weddings and business meetings in its large function rooms - this is were Instyle LED were called in to offer some suttle but effecting colourchanging lighting to create mood and atmosphere for all occasions. 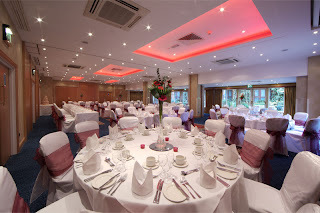 In the first function room the ceiling has 4 rectangular cut outs with coving, these are nice features in themselves. Instyle LED then fitted our standard RGB 7.2w LED tape all around each rectangular cut out.The LED tape was hidden perfectly in the covings and the effect was a smooth constant glow around each rectangular cut out. The customer was ecstatic with the results, it highlighting the feature magnificently and creating the desired mood and atmosphere as require. Linked to a DMX wall controller all 4 rectangular cut outs were controlled off the one wall controller allowing the customer to easily select any static colours, time delays and alter dimming. For the install the power supplies and receivers were all mounted in a cupboard and then 4 core 1.5mm cable was taken to the start of each RGB led tape run. Equipment used: 1 x DMX wall controller , 2 x DMX receivers , 40m x RGB 7.2w 24v LED tape. The second function room the customer wanted to light up the glass ceiling at night and for when functions are on. 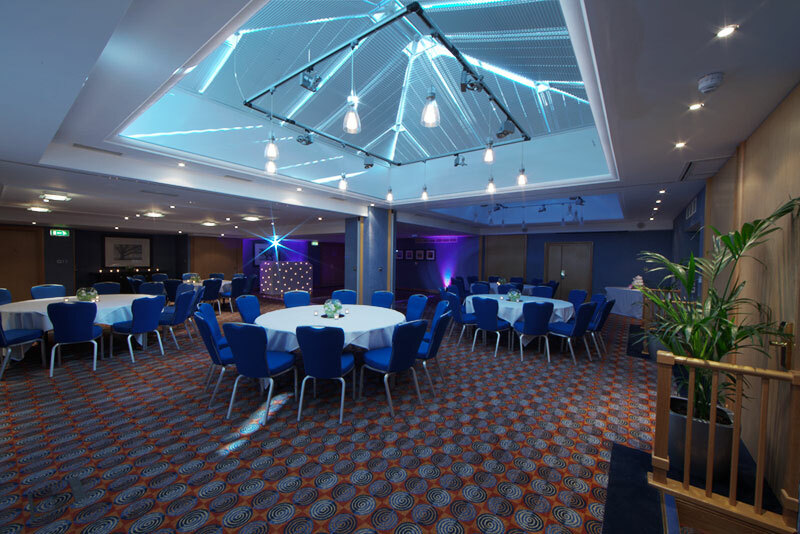 Slightly higher powered LED tape was required than the 1st function room as there was further to project. Instyle LED used the high bright 14.4w RGB colourchanging LED tape. This stuck on the ready made ledge facing upwards, at night this gave an amazing effect and the customer was extremely happy at how effective it looks. Due to not being able to get a cable behind the wall for a DMX wall controller the customer went for the RGB wireless remote system. This meaning the transformer and controller receiver were in the coving up next to the LED tape. A wireless remote control is then capable of selecting any shade of any colour , fulling dimming and colour scrolls. The customer loved how easy this was to install and the fact the wireless remote is radio remote meaning it can work a good 15m away even behind objects. Equipment used: 1 x Wireless RGB controller, 1 x 320w Transformer, 18m x RGB 14.4w Colourchanging LED tape.